Huffington Post – A civil liberties group says newly disclosed Canadian Security Intelligence Service records on protest surveillance bolster its formal complaint that spies went too far in eyeing environmental activists. The British Columbia Civil Liberties Association has asked the Security Intelligence Review Committee to consider the documents — which reveal CSIS deliberations on the proposed Northern Gateway pipeline — as it investigates the spying allegations. The association also wants to know why the spy service has shared intelligence with the petroleum industry, as well as copies of any notes, transcripts or recordings it has made available. Some activists are now afraid to protest because they might come under CSIS surveillance, said Josh Paterson, executive director of the civil liberties association. “It’s literally keeping people away from completely lawful activities — expressive activities that are part of our democracy,” he said in an interview. 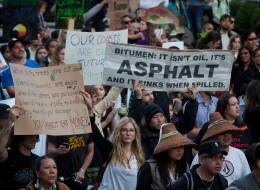 The Canadian Press reported earlier this month the latest documents show CSIS helped senior federal officials deal with protests expected last summer in response to resource and energy development issues — including a looming decision on Northern Gateway. CSIS prepared advice and briefing material for two June meetings of the deputy ministers’ committee on resources and energy, say the documents, obtained under the Access to Information Act. The spy service also gave deputy ministers a federal risk forecast for the 2014 “spring / summer protest and demonstration season” compiled by the Government Operations Centre, which tracks and analyzes such activity. CSIS did not respond to requests for comment on the records. Such intelligence-gathering and information exchange amounts to a “disturbing trend” that poses a significant threat to freedoms guaranteed under the Charter of Rights, Champ adds. It has been more than three months since the civil liberties association has heard from the review committee, he notes in the letter. The association is prepared to proceed with its complaint before committee member Yves Fortier to ensure the “inquiry into this important matter proceeds in a timely fashion,” Champ says. The introduction of government legislation that would give CSIS new powers to disrupt extremist activity has stoked concerns about surveillance of environmental and aboriginal protesters. The Conservative government insists the bill is aimed at giving police and spies more tools to prevent attacks by jihadi extremists — not clamp down on demonstrators. However, several witnesses — including the civil liberties association and Champ — have told the House of Commons public safety committee the legislation would lead to spy abuses.